Restless, lonely, romantic, the disparate protagonists in On The Nature Of Human Romantic Interaction safeguard their emotions behind walls of logic and knowledge. Privately, though, these scientific seekers yearn to find a love as steadfast as the equations and principles that anchor their lives. Even the most resolute researchers find their faith tested as they seek out the place where reason and passion peacefully coexist. A control theorist diagrams his troubled relationship with his girlfriend but fails to create a formula for romance. A jaded 19th century phrenologist must reexamine the connection between head and heart when he encounters a mysterious woman. A cynical forester catalogues her failed physical relationships, while daydreaming about her reclusive and brilliant mentor. Ultimately, each of them must transcend the concrete to explore the uncharted wilderness of the human heart. 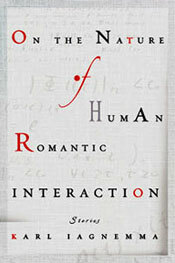 On the Nature of Human Romantic Interaction is published by the Dial Press. Many people view science as a chilly, rational exploration of facts, but scientific discovery is often shaped by emotion. Jealousy, fear, and desire can play as much a role in research as quiet contemplation. I wanted to write about people who long to uncover the mysteries of science, which are so often entangled with their own lives and the lives of people around them. And I wanted to show that although science has evolved, over the years, the anxiety and yearning of research continually repeats itself. Click Here for Karl Iagnemmas robotics-related webpage. ©2003 Karl Iagnemma. Website designed by Chris Costello.